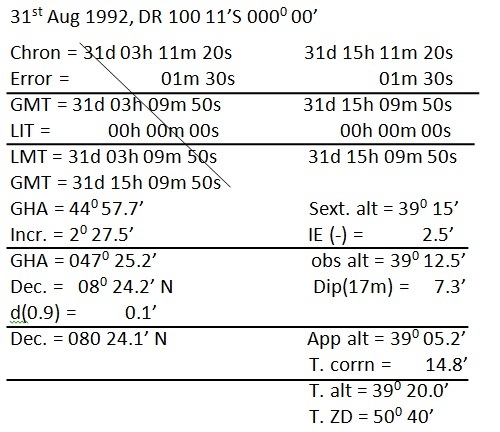 On 31st Aug 1992, PM at ship in DR 100 11’S 0000 00’, the Sextant altitude of the Sun’s LL was 390 15’ when the chron (error 01m 30s fast) showed 03h 11m 20s. 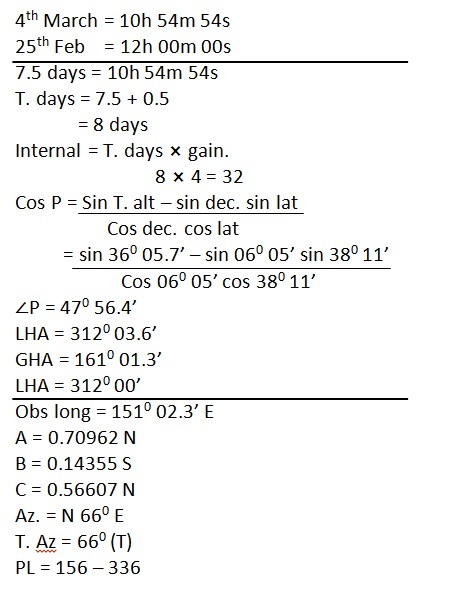 If IE was 2.5’ on the arc and HE was 17m, find the direction of the PL and a position through which to draw it. 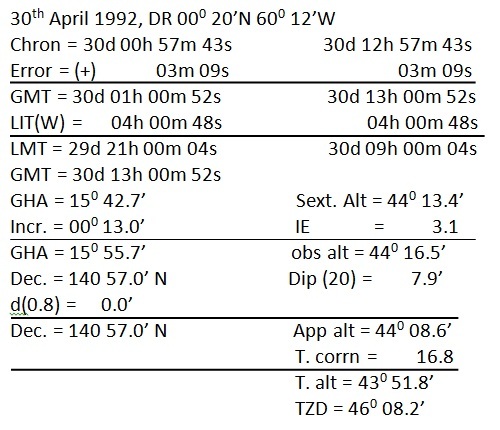 On 30th April 1992, in DR 000 20’N 600 12’W, the sextant altitude of Sun’s UL East of the meridian was 4404’ when chron (error 03m 09s slow) showed 00h 57m 43s. 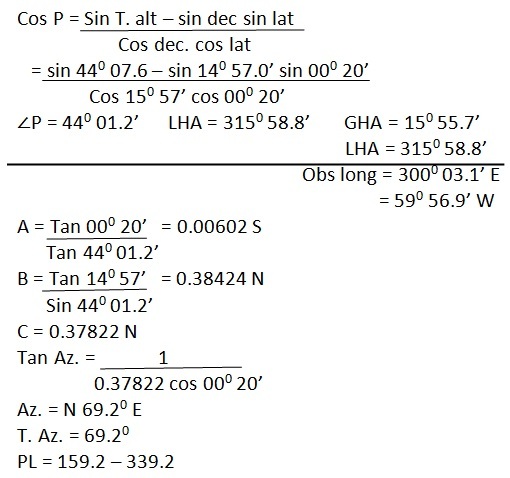 If IE was 3.1’ off the arc and HE was 20m, find the direction of the PL and the longitude where it crosses the DR lat. 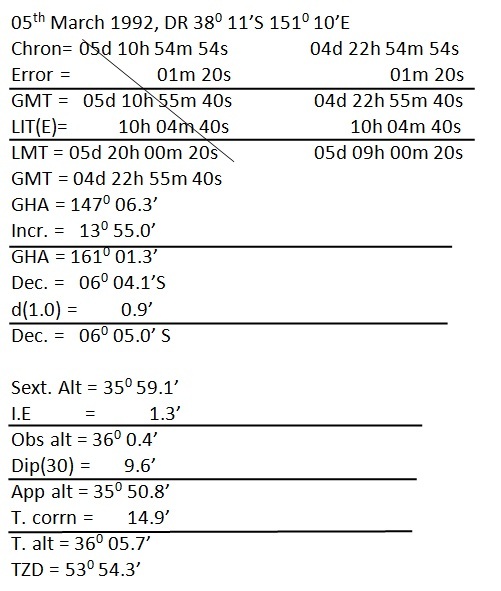 On 19th Jan 1992, at about 1530 at ship in DR 400 16’s 1750 31’E, the sextant altitude of the Sun’s LL was 4304’ when the chron (error 02m 12m 12s fast) showed 03h 50m 12s. If HE was 22m and IE was 1.5’ on the arc, required the direction of the PL and a position through which it passes. 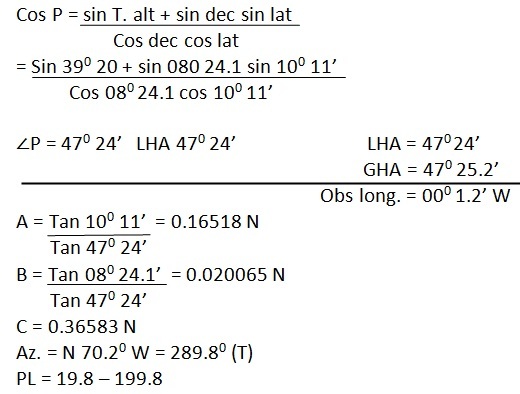 On 22nd Sept 1992, PM at ship in DR 480 20’N 850 40’E, the sextant altitude of the Sun’s UL was 2008’ when the chron (error 06m 18s slow) showed 10h 03m 20s. 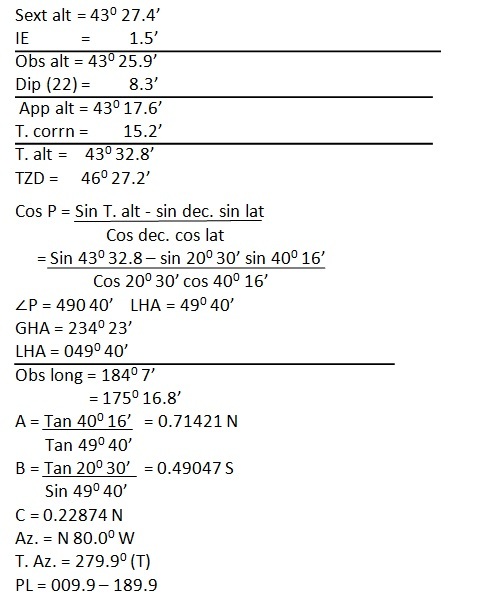 If IE was 2.2’ on the arc and HE was 25m, find the direction of the PL and a position through which it passes. 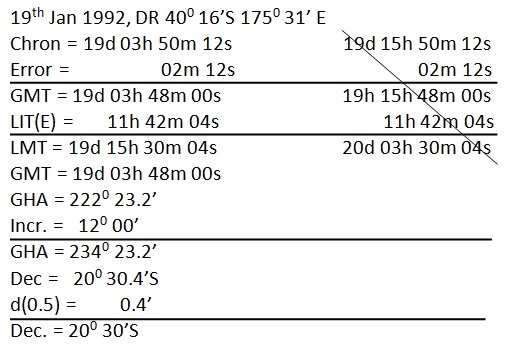 On 5th March 1992, AM at ship in DR 380 11’s 1510 10’E, the sextant altitude of the Sun’s LL was 3501’ when the chron showed 10h 54m 54s. 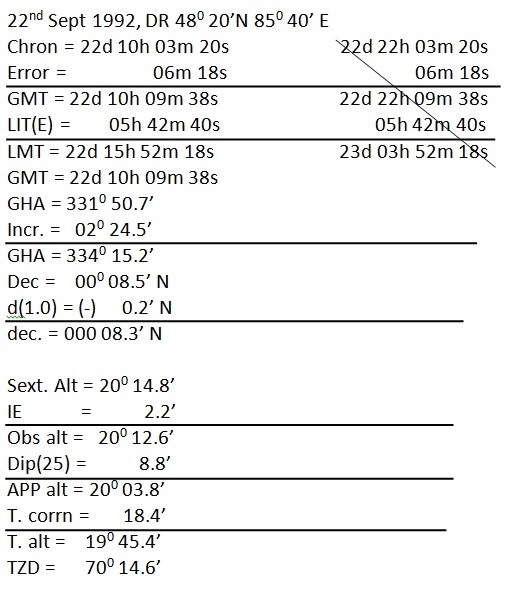 The chron was 01m 20s slow at 12h GMT on 25th Feb 1992 and gaining 4s daily. 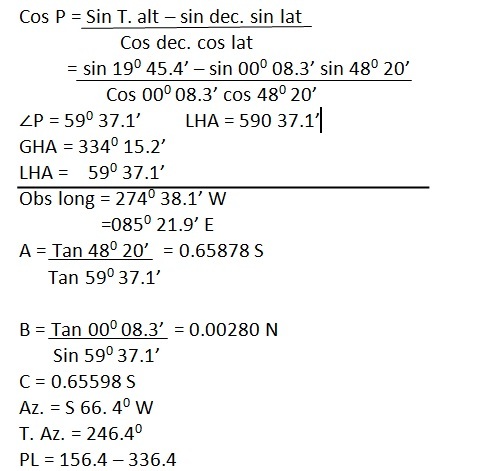 If IE was 1.3’ off the arc and HE was 30m, find the direction of the PL and a position through which it passes.